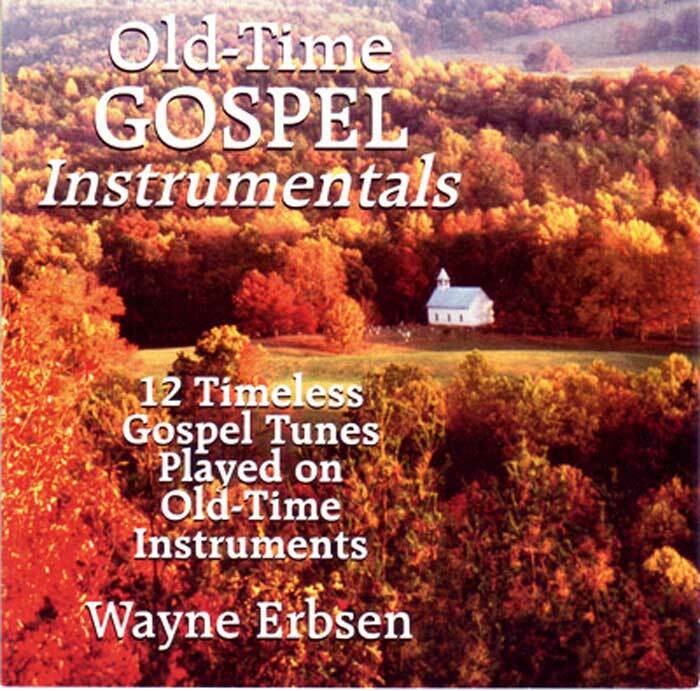 Wayne Erbsen captures the spirit of the old-time gospel and hymn music with haunting and lively renditions of many of the classic pieces of gospel music played on clawhammer banjo, fiddle, mandolin and guitar. 12 Instrumentals, 30 minutes. Click musical notes, below, to hear a short sound clip of that song. TUNES: Wayfaring Stranger What a Friend We Have in Jesus, I’ll Fly Away, I Will Arise, Uncloudy Day, Walking in Jerusalem, Working on a Building, Old Camp Meeting Time, Long Time Traveling, River of Jordan, Satin Your Kingdom Must Come Down, Methodist Pie. I’ve had a cassette copy of this recording since it was first issued back in the ’80’s I’d guess, and have jsut about worn it out from playing it so much. This is my all time favorite southern gospel collection, without a word on it…. Every note says it all. It is the only recording in my collection my husband keeps asking for. Only now, after years of appreciating this album, have I read the fine print on the liner notes to discover that the warmly percolating 5-string banjo, mandolin and guitar tracks reflect the skillful touch of Wayne throughout! All this time I only imagined he played banjo on this one. The tasty, soulful fiddling by Arvil Freeman is compelling without resorting to flashiness or gimmicks. In my book, Arvil is the real thing, ‘singing’ these heartfelt songs with the sonorous voice of his fiddle , going way beyond what a human voice can do without drawing attention to himself at the same time. There are some seamlessly beautiful gospel instrumentals here. Altogether this album has become such a ‘go to’ when I want to relax at the end of a busy day that I’ve nearly worn it out. Time to get it on CD so I can listen all the way through without having to hop up to flip the darn thing! My hat’s off to you, Wayne. Makes me wonder what else you’ve got here I would enjoy as much. Thanks for many years of enjoyable listening!